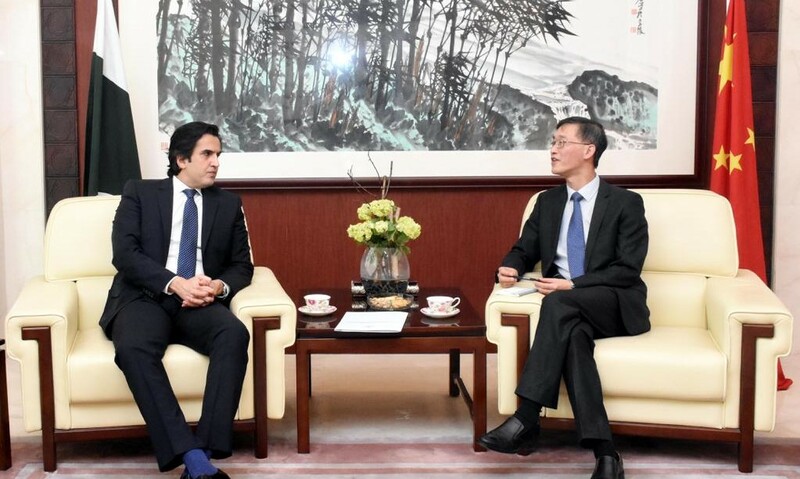 Islamabad Nov 26, 2018: Minister for Planning, Development & Reform, Makhdum Khusro Bakhtyar called on Ambassador Yao Jing at Chinese Embassy, Islamabad and condemned the attack on Chinese Consulate in Karachi. Both sides expressed their resolve to further strengthen and expand Pak-China Cooperation. Minister said Pakistan and China bilateral relations are time-tested, as we have a long history of cordial, friendly and strategic cooperation in all areas and domains. The whole nation is standing in support of Pak China relations and the cooperation in the shape of CPEC. Minister termed the attack as a conspiracy to sabotage China Pakistan Economic Corridor (CPEC). “However, these detractors cannot change our resolve on this mega cooperation. Evil designs of these will have to face a clear defeat” he added. Minister assured that a thorough investigation is being carried out to apprehend the perpetrators their financiers, planners and facilitators. Both side expressed their agreement to continue to work together and firmly move forward with CPEC by further strengthening and expanding its base. Ambassador Yao Jing strongly condemned the terrorist attack against Chinese Consulate in Karachi. He appreciated the quick, prompt and effective action of Pakistan security and Law Enforcement Forces who sacrificed their lives to protect the Chinese Consulate. He said that the terrorist attack was an attempt to impact Pakistan China relations and to harm CPEC. He stressed that Pakistan-China brotherhood was clad in iron and such cowardly attacks could not affect it. Minister said that Government of Pakistan is fully committed to providing foolproof security to Chinese nationals in Pakistan and CPEC projects all across the country. The two countries will continue to cooperate to thwart the designs of hostile forces against their times' tested friendship. Both sides discussed progress on CPEC projects and preparation for the upcoming Joint Cooperation Committee Meeting, planned next month. Minister said that Pakistan attaches top priority to the promotion of social-economic development and industrial cooperation sectors as a focus for the apex bilateral forum of CPEC.